Instant Pot Vegetarian Pasta – Rigatoni Bolognese – is a healthy, filling pasta dish that’s worthy to be in your regular meal rotation, and you won’t miss the meat! 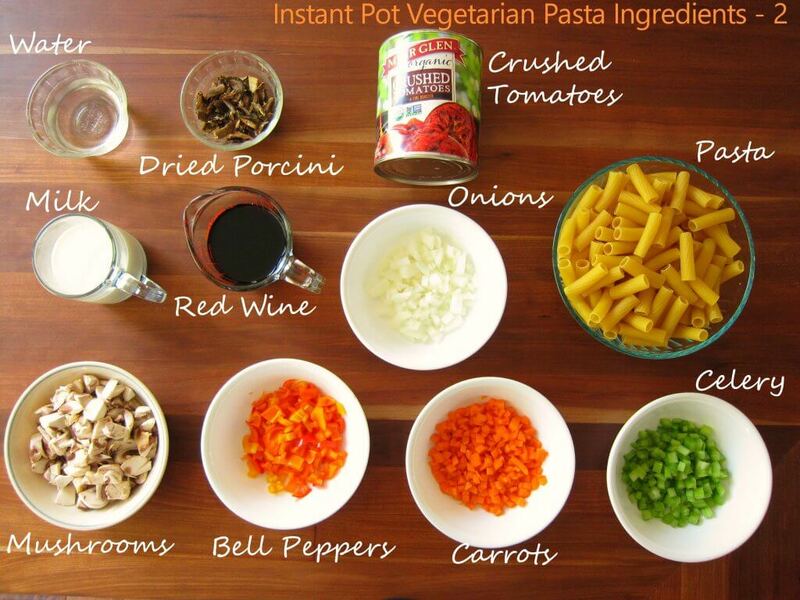 All the vegetables in this hearty vegetarian pasta recipe give the dish a meaty texture. The pasta and sauce are cooked together making it a delicious one-pot meal. 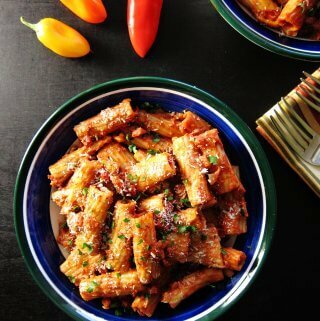 Although I love traditional spaghetti bolognese with meat, a few years ago I found a Giada De Laurentiis recipe for a vegetarian rigatoni bolognese and adapted it to make a pasta dish that’s perfect for vegetarian meals and meatless Mondays. For the Instant Pot version of my recipe, I cook the pasta and sauce together, to make yet another delicious one-pot meal. The bolognese-style vegetarian sauce is made with lots of vegetables – onion, celery, carrots, bell peppers and mushrooms – which gives it a thick, meaty texture. One of the things I love about making pasta in the Instant Pot pressure cooker is that I can cook everything together: the pasta and the sauce. It’s so convenient and easy to get this vegetarian pasta on the dinner table on busy days: in less than 30 minutes with minimum cleanup. Don’t be deterred by the list of ingredients! I know it’s long, but if you’re organized and can gather everything up before you start cooking, you’ll find that it comes together very quickly. Saute your vegetables in the Instant Pot first, then put in the remaining ingredients except for the cheese and parsley, and pressure cook. That’s it. Porcini mushrooms are earthy, wild mushrooms that have a nice meaty texture. Dried porcini mushrooms are normally soaked in hot water, and the soaking liquid is added to the dish during the cooking process. In this Instant Pot Vegetarian Pasta recipe, I skip the soaking step and add the chopped dried mushrooms to the pasta along with the other ingredients. The leftovers make a perfect vegetarian lunch the next day. You can make this Instant Pot vegetarian pasta for a crowd by doubling the recipe and cooking it in separate batches. If you’re looking for a tasty Instant Pot Pasta recipe with meat, learn how to make Instant Pot Penne with Sausage and Tomato Cream Sauce – it’s fabulous; another one-pot pressure cooker pasta dish that’s quick and easy. Dried porcini can be pricey, so you can substitute dried shiitake mushrooms or mixed mushrooms. 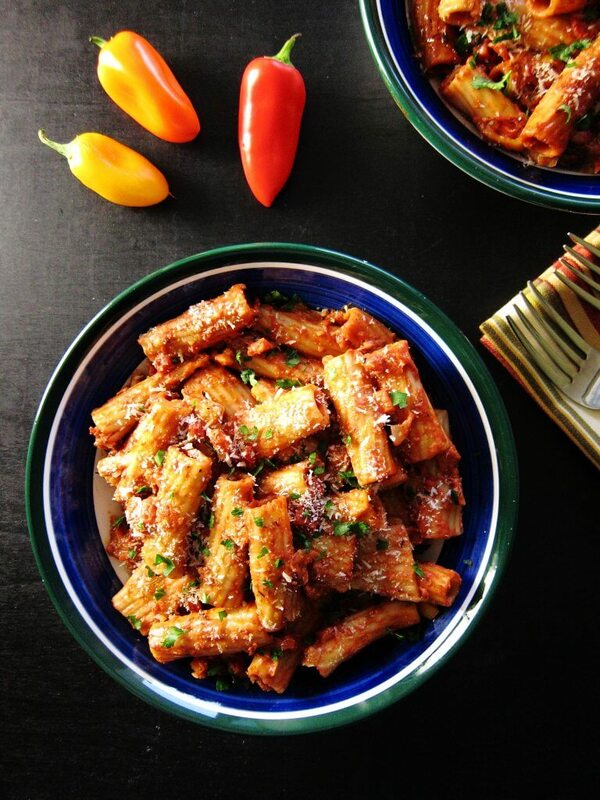 This vegetarian pasta is finished with mascarpone cheese and freshly grated parmesan cheese. Mascarpone is an Italian cream cheese that’s softer and creamier in texture than regular cream cheese and is used to make Italian desserts like tiramisu. If you can’t find mascarpone, you can try and substitute heavy cream or cream cheese. 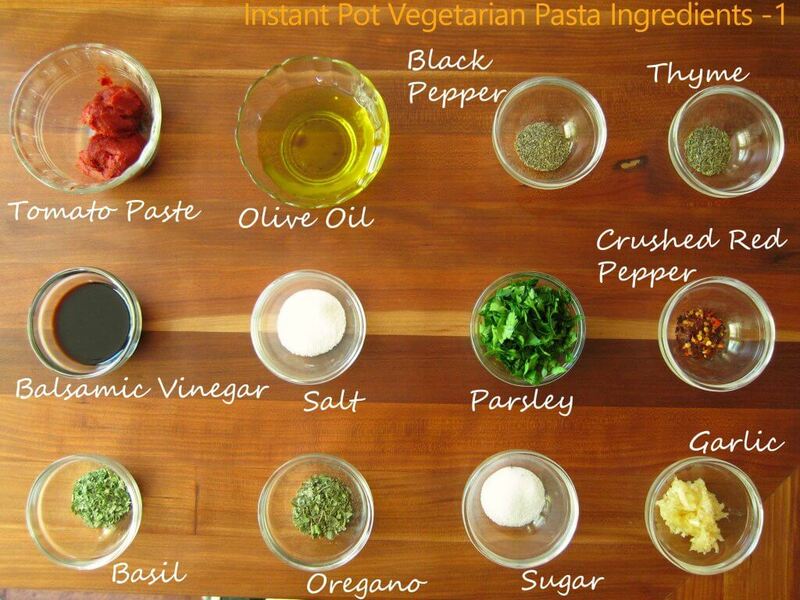 If you’re new to the Instant Pot and aren’t familiar with how to use it, please read the Instant Pot DUO Beginner’s Quick Start Guide or the Instant Pot ULTRA Beginner’s Quick Start Guide first and then come back here to learn how to make Instant Pot Vegetarian Pasta. Add onions, celery, carrots, bell peppers and garlic and saute for 3 minutes, stirring frequently. Add mushrooms and saute for 2 minutes. Turn off Instant Pot by pressing ‘Cancel’. If there’s food stuck to the bottom, deglaze inner pot with 2 tablespoons of water. Add in dried porcini mushrooms, crushed tomatoes, black pepper, salt, thyme, oregano, basil, sugar, balsamic vinegar, tomato paste, crushed red pepper, pasta, milk, wine and water. Close Instant Pot Lid, and make sure steam release handle is in the ‘Sealing’ position. Press ‘Manual’ (or ‘Pressure Cook’) and ‘+’ or ‘-‘ until display reads ‘7’ (7 minutes). The display will count down from 7 to 0; it will switch to ‘Keep Warm’ mode and display ‘L0:00’. Do a Quick Release: move the steam release handle to ‘Venting’. I like to place a folded towel over the steam release handle and move it to the venting position. Remove the towel after turning the knob. When your Instant Pot is depressurized, the float valve will be in the down position. There might seem to be more liquid than you’d like, but don’t worry, the liquid will get absorbed by the pasta. Let the pasta rest for a few minutes and it will thicken up. Sprinkle each serving with parmesan and fresh parsley. Instant Pot Vegetarian Pasta – Rigatoni Bolognese – is a healthy, filling pasta dish that’s worthy to be in your regular meal rotation, and you won’t miss the meat! Press ‘Saute’ and add olive oil to inner pot of Instant Pot. Add fresh mushrooms and saute for 2 minutes. If there’s food stuck to the bottom, deglaze pot with 2 tablespoons of water. Cook on ‘Manual’ (or 'Pressure Cook') mode for 7 minutes. Do a quick release of pressure. Prep time does not include steps that are already accounted for in the ingredient list, e.g. chopped onions, minced garlic, diced chicken, etc. Adapted from Giada De Laurentiis Vegetarian Pasta Bolognese. 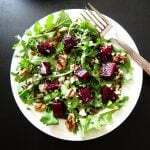 If you loved this recipe, please give it a 5 Star rating in the comment section below and/or share on social media using the social media share buttons at the top and bottom of this post. Thank you! Simple, healthy, tasty – we loved it. Thank you! Delicious! Another family favorite. So rich and flavorful, didn’t miss the meat one bit. Thank you Monica! I think the mushrooms and other vegetables add a nice ‘meaty’ texture to the pasta. Just made this myself two nights ago. Karen – haha! That’s usually me with anything having to do with chocolate ? I’m so happy you liked it! Hi! Excited to try this recipe but I’m new to the instant pot——is the pasta I cooked when you put it in? Or did you cook it ahead of time? Thanks!! Hi Kristi, the pasta is uncooked. Hope you like the recipe. and enjoy your new Instant Pot! Thank you for the comment – I’m really glad you liked it and were able to change it suit your tastes! Want to make this but hubby is lactose intolerant. 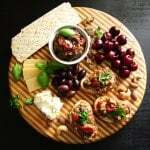 What can I substitute for mascarpone cheese? Hi Karen, thanks for the question. The mascarpone balances out the tomato and thickens the sauce a bit. I haven’t used a vegan cream cheese, but is that an option for you? Otherwise, try and omit the cheese and see how you like it. The pasta and sauce thickens on its own after cooking is complete but if you want to thicken some more, just cook on saute mode for a few minutes, stirring often. I made this yesterday and all was going well until I got the “burn” message about two minutes into pressure cooking. Was able to thicken the sauce up some on sauté and it still came out tasting pretty amazing. But I was wondering if you might know what I did wrong. The only difference I know of is that I was using a ceramic non-stick insert instead of the standard aluminum. I was using the IP Duo 6qt. Prior to pressure cooking I scraped the bottom and nothing was stuck to it as far as I could tell. Any advice would be great! Thanks! – Then add those final two ingredients last and DON’T stir; just push down to make sure they’re covered by the liquid. – You might need to add a 1/4 cup more liquid, but you might want to try without first. Keep me posted if you find anything out. Thanks for your question. So I can’t speak for this one yet, but I just tried your adaped instructions with the penne with sausage in tomato cream sauce And that worked perfectly! No “burn” message. Thanks so much for the help! Oh, great! That’s great to know. Did you add any additional liquid in that recipe? Thank you for updating us! No additional liquid other than the fact that I used two 15oz cans of crushed tomatoes instead of one 28oz can but I doubt the 2oz made much difference. No additional water though just water first in with the sausage, then noodles, then peppers and other ingredients, then crushed tomatoes. Came out perfectly! Do you think the flavor of the pasta be affected greatly if I simply omit the dried porcini mushrooms? Dhanya – you should be fine, maybe add a few more of the other mushrooms for more bulk, but not necessary. The dried porcini absorb some of the liquid. Can you substitute something or simply eliminate the wine? Hello! Can you double this recipe in the six quart IP? I’d like to make this, but need it for about fifteen people! Hi Neha, I don’t know if you can double the recipe, I haven’t tried that. You need to make sure that the pasta and liquid together don’t go past the halfway mark, to account for expansion. You might be able to do 1 1/2 times. Sorry if this is silly question but I’m new to Instant Pot. In order to deglaze, do I remove the contents, then clean the pot and then put the contents back in? Not a silly question, Rani. You do not need to remove the contents. You just add a tablespoon or two of liquid and scrape the bottom. Key to deglazing is that the pot needs to be hot and that helps dislodge the browned food from the bottom. Good luck with your new Instant Pot! Great thanks! Does the water just burn off? That’s right, Rani – it does evaporate. The key is not to add too much liquid – just a few Tbsp at a time. Can you half this recipe and make it in 3 quart? I’m new to this. Thanks. Hallie, I haven’t tried making it in a 3 quart, but I don’t see any reason why not, because there will be enough liquid for the 3 quart to come to pressure. Made the meal for my fiance and she loved it. Thank you for postung. Lucky fiance 🙂 I’m so glad to hear y’all liked the recipe. Thank you for taking the time to comment and rate the recipe! Hi Deb! The recipe was tested for 12 oz (I use a kitchen scale), which is 3/4 of the box. If you use the whole box, make sure you increase the quantity of liquid by about 2/3 cup (e.g. milk, water, broth, wine, etc). It should work. Thank you for the recipe! 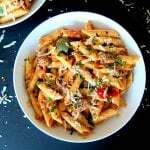 I have a 3 quart IP, so if I want to make the sauce to later serve over pasta, as opposed to pressure cooking the pasta, how should I adjust the cooking time? Rohan, the recipe contains quite a bit of extra liquid to allow liquid to be absorbed by the pasta. Reducing that liquid will probably result in a burn message when you pressure cook, because of the tomatoes. You could cook in ‘Saute’ mode or on the stovetop. Hello! I am planning on making this tonight, however it needs to be dairy free. Do you think I could substitute the milk for coconut milk and the cheese for Nutritional Yeast? I know it won’t taste quite the same, but hopefully more or less? Hello! I’m planning to make this tomorrow using the 3 quart instant pot. I will half the quantity of ingredients. My question is should the manual mode pressure time of 7 minutes reduce also? Or stay the same? Also is there anything I can replace the milk with? Trying to omit dairy. Hi Prerna, yes you would halve all the quantities but keep the cooking time the same. The dairy comes from milk and cheese. Replacing them would change the taste a lot. I’m not sure how almond milk would work – it would give it a different taste but maybe okay?